In the earlier post, we had introduced, eight web tools for taking screenshots. Here we take a look at six more tools, which you can use for capturing screen images to be used in your blogs or online articles. Snissa: Simplicity is the key here. Ideal for taking screenshots of the entire webpage. Screengrab: Creates an icon in your status bar, simple to use. You can select an area on your screen or an entire window for screenshot. PrintKey: A sophisticated version for your printscreen function. Resides in your system tray and gets activated with the press of PrintScreen key. Then you can save the image and edit it as well. I4X Screencatcher: Allows you to take screenshots of the active window, your whole screen, an area you select or a selector box. 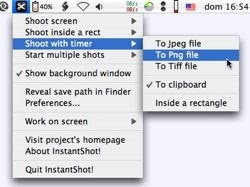 InstantShot: An advanced screenshot tool for OS X, supports JPG/TIF/PNG selection and timer functionality. Options include capturing a region, hotkeys, several output formats, image scaling and many others. Thumbalizr: Just enter the target-URL and press the "thumb it"-button. Wait a moment and a screenshot of the desired page will be taken.